ISLAMABAD: Foreign Office Spokesman Dr Muhammad Faisal on Thursday said that China-Pakistan Economic Corridor (CPEC) projects are not under review and Prime Minister Imran Khan’s statement in this regard was misconstrued. During his weekly press briefing, Dr Faisal said that however, both China and Pakistan were open to the third-party inclusion in the project. Last week, while vowing to give Balochistan more than its due share in the multi-billion dollar CPEC, Prime Minister (PM) Imran Khan had said the projects were being reviewed to safeguard rights of people of all provinces. “We also welcome other countries to invest in special economic zones under CPEC,” he added. He said that communication with the United States (US) has increased since the Pakistan Tehreek-e-Insaf (PTI) led government assumed office. “It is the responsibility of the US, Afghanistan and all stakeholders to bring Afghan Taliban to the negotiating table and owing to this Ambassador Zalmay Khalilzad is also visiting other countries,” he further said. “Engagements with the US have increased since the assumption of the present government,” he added. Moreover, Dr Faisal said that the S-400 deal between India and Russia will not only disturb the balance of power, but will also push the region to engage itself in an arms race. He said that Pakistan wants peaceful relations with India. 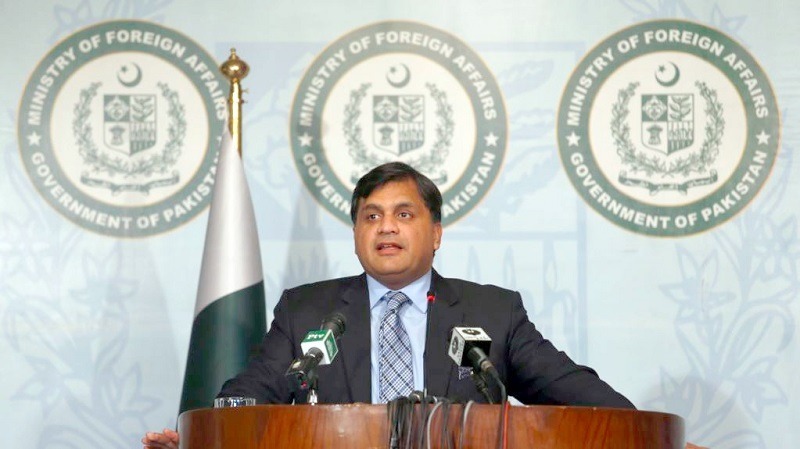 The FO spokesperson said the countries which are providing weapons to India should make sure that their assistance does not disturb the balance of power in the region. He pointed out that human and economic development is the stated policy and manifesto of the present government and by indulging in the arms race, the resources cannot be diverted to the development. The spokesperson, however also made it clear that Pakistani nation and the armed forces are fully ready to respond to any aggression. Further, Dr Faisal said that Pakistan has never shied away from talks with India and is open to discussing all issues, including Jammu and Kashmir, Sir Creek, Siachen and terrorism. Responding to a question regarding Pakistanis detained in jails in different countries, Dr Faisal said that Pakistani embassies in Saudi Arabia and Thailand were lending all possible support to the prisoners. He added that the Pakistani high commission in Saudi Arabia was in discussion with a Saudi construction company to convince the company administration to release one month salary and travelling expenses of Pakistan’s employees. On a question regarding foreign INGOs working in Pakistan, Dr Faisal said that international organisations were involved in the development work and they were allowed to continue their activities under the Pakistani laws. He said the ministry had recently reviewed 141 foreign NGOs working in Pakistan and 74 had been allowed to continue their activities.